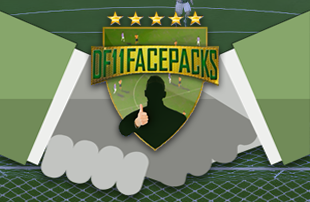 The DF11 Megapack is your base pack for all DF11 faces. It covers at least 77 playable leagues in Football Manager with 109.500 faces! Keep your DF11 Megapack fresh and new every month. to over 121,300 DF11 faces! and expand your DF11 Megapack to over 121,300 faces! You can use your DF11 Megapack for a 'lifetime' by updating it every month! including over 119,000 DF11 Icon faces. Easy and fast 1-minute download. These skins are created by the best skin-creators in the FM community. the DF11 faces in real size in many versions of Football Manager. playing the standard in-game skin. Even with 122,000 DF11 faces, you will have missing faces in your game. in a smooth uniform DF11 style! With our DF11 Megapack and DF11 Update packs, you'll get the best facepack for free! for personal use in Football Manager." Please contact us when you like to start a partnership, or when you like to use DF11 Facepacks in any other manner.